The above Facebook post was published to the world wide interweb. It was suggested in the comments that the domain name be purchased, and my husband is never one to pass an opportunity to buy a domain name. I’m not exactly sure what his intent was when he bought the domain name. He probably told me, but I likely wasn’t paying attention. My less than stellar mother skills are only slightly better than my completely dismal wife skills. In my defense, it’s also possible I’ve forgotten. This was two and a half years ago. I can’t remember yesterday. I have been writing sporadically and threatening to start a blog for almost a year now. In that time I hired a graphic designer to help come up with a name and logo. 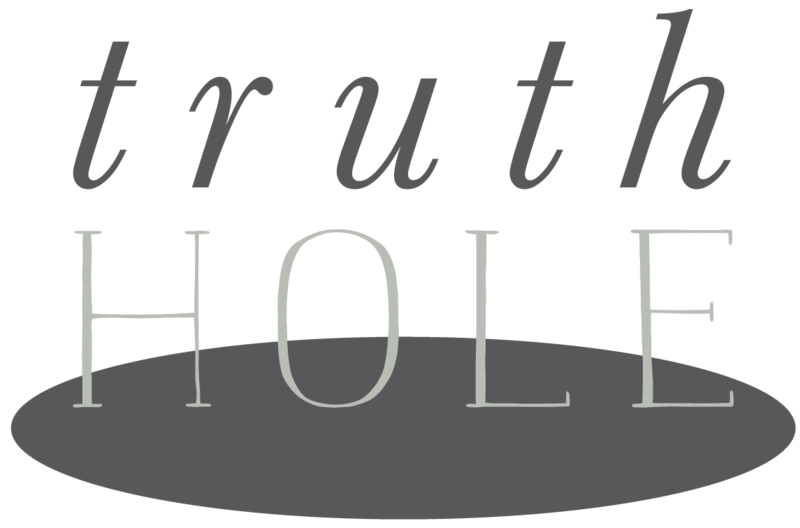 After a lot of back and forth and settling on a completely different name and logo, husband recalled the long ago purchase of truthhole.com. And, VOILÀ, here we are. Such a trajectory is standard protocol for the Holt family. We don’t travel in straight lines and firmly believe efficiency is best left to those with zero imagination.